Capsule Summary: Sidney Friedman is depressed so he takes a vacation at the 4077th. Meanwhile, Hawkeye encounters a self-centered bomber pilot. 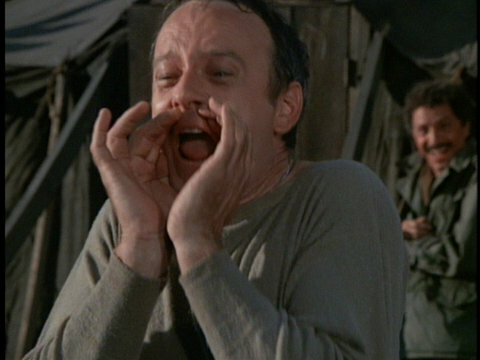 “Dear Sigmund” is the fifth episode of M*A*S*H to feature Allan Arbus as Sidney Freedman. For the most part it’s a relatively low-key episode but it’s a very good one. Sidney penning a letter to Sigmund Freud allows him to briefly discuss each character, offering snapshots of life at the 4077th over two weeks. It’s a familiar conceit for the series used uniquely here because it’s not from the point of view of a main character. Sidney doesn’t play much of a role in the episode himself but we learn enough from the few scenes that actually focus from him. He’s frustrated with his job and clearly depressed after losing a patient. Somehow, visiting his friends at the 4077th is therapeutic and he leaves in better spirits. Although it’s probably not reasonable to believe Sidney could actually stick around the 4077th for two weeks, I’m willing to overlook that minor detail. As is the case with all the “letter home” episodes, viewers must also be willing to believe that Sidney was either present for all of the events he writes about or heard about them in detail from someone else. He clearly wasn’t in post-op when Hawkeye was parading around in a tuxedo. Nor was he there for Klinger’s latest stunt or any of the practical jokes other than the one he participated in and the one pulled on him. Unless I’m mistaken, Sidney comments on the personalities of everyone at the 4077th except for Frank. After their talk about Frank’s wife, Sidney does say “it’s a wonder more people don’t take a vacation from reality,” which sheds some light on his opinion of Frank Burns. What’s worse, it’s not like Hathaway can stop being a bomber pilot. Now that he’s seen a wounded little girl in surgery–a girl whose village he may have inadvertently bombed–he has to go back up in the air and keep dropping bombs. He has a job to do. Before he could pretend he was just flying through open sky, drop his load, and return to Tokyo without agonizing about his role in the war. Hawkeye hasn’t helped Hathaway. All he’s done is make one pilot miserable. Perhaps this would’ve worked better as the A story in another episode rather than a minor B story. The story line would benefit greatly from Hawkeye realizing that maybe Hathaway isn’t as cavalier as he seems and maybe even apologizing for forcing the pilot to come face to face with the consequences of simply doing his duty. I’m not sure whether the overturned ambulance constitutes a C story or not. Sidney is involved and vaguely references in his letter–in connection with Father Mulcahy–but it’s a large part of the episode. I love the scene in which Colonel Potter yells at Radar about O’Donnell only to learn the man he’s furious at has died. The letter Radar writes to O’Donnell’s parents is touching, although I don’t believe for a second that a man like Potter would let someone else write letters like that. Sal Viscuso, credited as Patient John (the soldier who initially doesn’t want to go back in an ambulance), made a total of three guest appearances on M*A*S*H but he’s much better known for being one of the uncredited P.A. announcers. 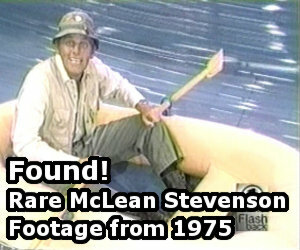 “Dear Sigmund” is one of just two M*A*S*H episodes to feature subtitles on screen. The other is “Communication Breakdown” in Season 10. I don’t know about anyone else, but if I were recuperating at the 4077th and one of the doctors performed rounds wearing a tuxedo and flippers on his feet, I would be concerned. The tag scene runs just 20 seconds, making it perhaps the shortest tag ever seen on M*A*S*H.
Alan Alda frequently cites this as being one of his favorite episodes, and he’s often said that he felt Allan Arbus was so convincing as Sidney Freedman that he wanted to give Sidney a chance to shine in an episode of his own, and came up with the idea that maybe sometimes even psychiatrists may need a psychiatrist, hence Sidney writing to Sigmund Freud. There’s something about this episode you forgot to write about, RJ: the rash of pranks and practical jokes that had been plaguing the camp – nobody was safe from the “mad joker,” and nobody knew who he was . . . that is, until, Sidney discovers it’s B.J. Klinger’s stunt about faking amnesia and speaking only in Arabic is completely cut from syndication, but I don’t mind too much – M*A*S*H was a little too sophisticated for the old subtitle gag, so it felt odd and out of place on this show. It works better on a kookier show, like GREEN ACRES for example, maybe even HOGAN’S HEROES, but not M*A*S*H.
Still, this is a really good one. This is my favorite of all episodes. It shows the characters at their best written forms, it has the most heartfelt laugh for me (Col. Potter and the binoculars) and it has my favorite recurring guest star. I have seen this episode more than any other and it still never gets old. I always liked the Sidney Freeman character. I think he’s one of the few good portrayals of a mental health professional on TV or in film. Many of them are portrayed as being more messed up than their patients, Sidney is a regular guy who just happens to be a psychiatrist. Allan Arbus did a great job with the character and he will be missed. Like all the “letters home” episodes (with the exception of “Dear Uncle Abdul”), this is one of my favorites. But the practical joke on Frank Burns, though funny, doesn’t stand the test of logic. I agree the subplot about the bomber pilot was ill-conceived. Bomber crews are given extensive briefing before each flight, studying maps and aerial photos of the area, they know exactly what they are bombing. FWIW, since he mentioned no crew he was probably an F-86 pilot. ” I can’t see BJ wasting real eggs for a practical joke with all the complaining they do about powdered eggs. Hawkeye’s dealing with the bomber pilot did seem a little unfair-where did he think other civilian casualties came from? I liked that BJ was the mad joker and it would go into his reputation as a premier prankster in later episodes. Sidney’s observations on the folks at the 4077th give a unique outsider’s view on their character. One very minor continuity error – Klinger compares his earrings to hula hoops, in a much later episode he trys to get Charles to invest in the early version of hula hoops that the Korean children were playing with. Rewatching it now, this is one of my favorite episodes, top 3 at least. Unfortunately the gags of Potter and Klinger are cut from WGN syndication. Maybe it’s because of my love for flying, but the conversation between Hawk and the pilot always hits me hard. Definitely going to find the full cut of this episode to watch soon. After all the years since this episode aired,it seems as if no one reckognizes such a hidden question. How is it Dr. Sydney Freedman, in the Korean War ( 1950-1953),writes a letter to Sigmun Frued who died in 1939? It was a therapeutic mechanism. He isn’t really going to stick the letter into an envelope and try to mail it off to Freud. He used it like others would use a journal to be able to express what they are thinking and feeling. BTW, I found you guys about 2 weeks ago and reading these recaps during my current binge watch. The funniest thing about this episode is how much your can really notice how 70s Jamie Farr’s hairdo is. Everyone else at least tries to look 50s but Jamie has long almost mutton-chop side burns and extremely thick John Travolta hair. For some reason it was very noticable in this episode. This is one of my favorite episodes. I love the way Sidney sums up the main characters. Somehow he is so calming! Great actor. By the way I love these reviews/summaries! I started watching MASH back in high school and it has since been my all-time favorite show. I go through the DVDs all the time and can see what’s happening in each episode even if I’m not sitting there watching it.. does that make sense? I feel like I know them so well. Anybody else? Also, did anyone notice the brown winter coat Radar wears in the “first day of spring” scene? Does he ever wear that coat again? Looks kind of out of place. For real though, could you ever get tired of watching Frank fall into that water-filled fox hole?? Priceless. B.J. being the practical joker is one of my favorite gags of all of MASH. It’s just such a great way to round out his otherwise calm, levelheaded character, and I love Sidney’s description of him which then segues to his reaction / surprise in finding out he’s the prankster. Love both of those characters a ton.